When young beginners start reading on the staff there are two often-confused sets of notes: Bass B vs. Treble D and Bass A vs. Treble E. When playing in Middle C position, not only do these notes share visual traits, but they’re also played with the same finger in each hand. And while piano students don’t remain in Middle C position for very long, it’s a great idea to give your budding note-readers the strategies, skills, and practice that will provide a solid foundation for future note reading. In WunderKeys Primer Book One, Maxine the Skunk helps your student clear up A vs. E in a way that isolates these two notes and ensures your student will never confuse the two again. Today we’re sharing a printable you can use as an extension activity (use along with WunderKeys Primer Book One, Lesson 9) or as a review for students who need additional practice. It pairs note reading with keyboard awareness for a slam-dunk activity! Click on the image below to download today’s printable. 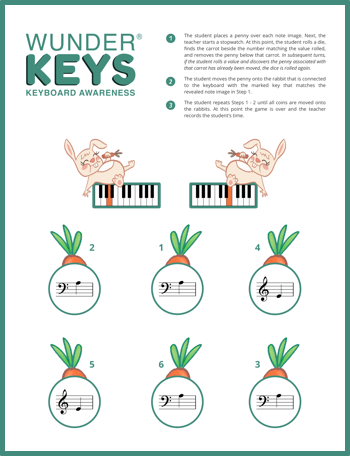 And don’t forget to check out our newly-released WunderKeys Primer Piano Book Two!